Xavier fans will be excited to know that we have given Xavier a full 90 minute headline set!! One of the most important Australian artists of all time, with each record he has created something new and unique, yet unmistakably Xavier Rudd. His ninth studio album, Storm Boy (coming in 2018), is a stunning addition to his legacy – instantly earning its place among his finest work. 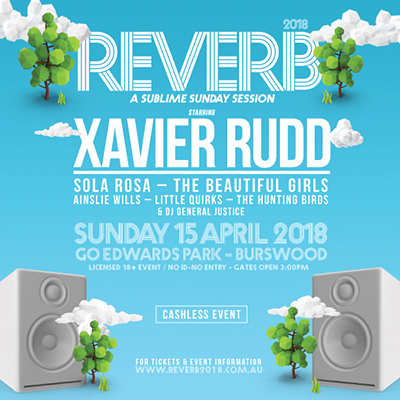 To the delight of his fans, Xavier has announced an Australian tour to celebrate Storm Boy's glorious first single, Walk Away. Walk Away is out now! Sola Rosa’s steadfast commitment to making great albums that seamlessly blend a myriad of genres, from hip-hop and jazz, to neo-soul, dub, latin and funk, has given them an evitable reputation as one of NZ’s finest and innovative bands around. Periscopes, Music, Blackbird and LaMar, amazing performances all over the planet, the voice of Mat McHugh, heart-on-the-sleeve songs, pioneering Australia’s surf-roots-reggae sounds; these are things fans worldwide think of when they think of The Beautiful Girls. Now Mat has decided to strip back the performances to their original essence – the striking three-piece sound which first brought the band to attention fifteen years ago. Ainslie Wills has earned an enviable reputation for writing songs that are musically powerful and earnestly delivered. Ainslie Wills sets out to create music that is genre bending, unique and personal. With a captivating and commanding stage presence, Ainslie’s music has seen her tour both nationally and internationally, including sold out headline shows in Australia and UK. Ainslie’s latest release ‘Running Second’ has recently been nominated by APRA for ‘Song of the Year’. Little Quirks are a young, all-girl trio made up of sisters, Abbey and Mia, and their cousin Jaymi from the New South Wales, Central Coast with an endearing and unpretentious indie-folk approach to their music , having had the pleasure of sharing the stage with legends Tim Rogers, Mark Seymour and Busby Marou amongst others as well as performing at festivals including ‘Grow Your Own’, ‘The Lighthouse Folk Festival’ and the celebrated ‘Mountain Sounds Festival’. Perth’s very own The Hunting Birds are a captivating five-piece whose genre-defying sound blends heartfelt folk qualities with exhilarating rock energy. Coming off the back of a big 2017 for the band 2017 highlighted by performances at the Falls Downtown Fremantle, two east coast tours, and supports for The Lumineers and Hanson, The Hunting Birds are gearing up for another big year as they gear up to release their debut EP. We groove… rain, hail or shine!